It was a fun match to watch, at least if you were a Serena fan. She didn’t exactly tear through her like I thought, but it wasn’t much of a struggle, either. Serena won the first set handily, 6-4, but Jankovic rallied to capture then lose then re-capture a break advantage in the second, eventually losing it 7-5 after failing to convert a couple set points. I’ve been unsure how to feel about Jelena Jankovic since she came on the scene, but she definitely won me over tonight. She can come across as a bit of a pouter sometimes, but she was all smiles here, even in defeat. Plus her mom is awesome. I’ve never seen another tennis parent be so calm and objective about their kid, even when said child is losing. Nothing seems to faze her. I also respect how she made Jelena stay doing school, which prevented her from rising up the rankings earlier and faster than she did. If she would cut out her Djokovic habit of calling the trainer for every hangnail, I’d be able to root for her wholeheartedly. Can’t wait for tomorrow’s men’s final, even at the odd hour (5 eastern/2 pacific on a week night?). 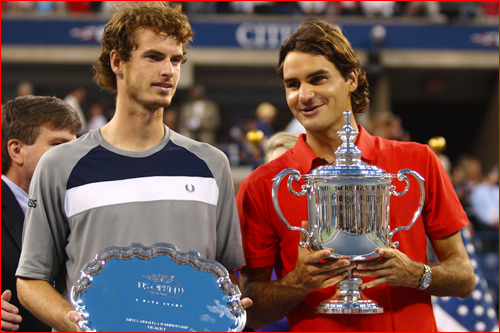 Andy Murray has looked much more mature and composed, but I still can’t forgive him his previous sulking. Maybe if he sticks with the new approach for a little longer. In the meantime, go Federer. Let’s make it five in a row. It was a bizarre day at the U.S. Open. Because of the certainty of rain later in the day, they moved the start time up for the matches, with Federer and Djokovic starting an hour earlier than originally scheduled. Then, around the second set of that one, they started the Nadal-Murray match on Armstrong simultaneously instead of having them wait till the conclusion of Federer-Djokovic to play on Arthur Ashe. Fed managed to finish off Djokovic in four sets before the rain kicked in, but Nadal and Murray had to stop short in the third set. Nadal had lost the first two sets to Murray, who was playing simply out of his mind, although Nadal was up a break in the third when play halted. It was a disappointing (start of a) match to say the least, especially for someone who roots against Andy Murray as avidly as I do. I hear he’s toning it down a little lately, but he still acts like too much of a baby out there. My husband and I always laugh about his yelling at his coaches from the court, at one point in one match shouting, “I’m trying my hardest!” Oh really, Andy? I’m pretty sure everyone is at this level, so get over it. He’s no Djokovic, and I’d be much less disgusted to see him win the whole thing than Novak, but if he pulls out the win over Nadal I’ll be pulling that much harder for Federer. Not to count out Rafa yet, which you should never do, but he’ll need a major overhaul tomorrow if he wants to force a fifth set. We shall see. 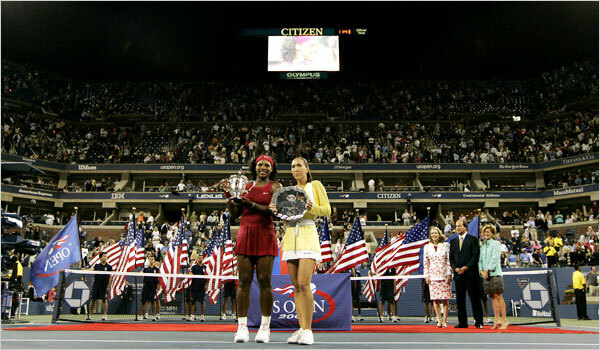 All this means that the women’s final between Serena Williams and Jelena Jankovic will take place tomorrow and the men’s final will be on Monday. I’m excited, but I’ll miss the tennis when it’s over. At least the European soccer leagues have started up, so I’ll have something other than baseball during the tennis break.